On our 3rd and final installment of Thanksgiving 2007, a handful of us ventured into the city. 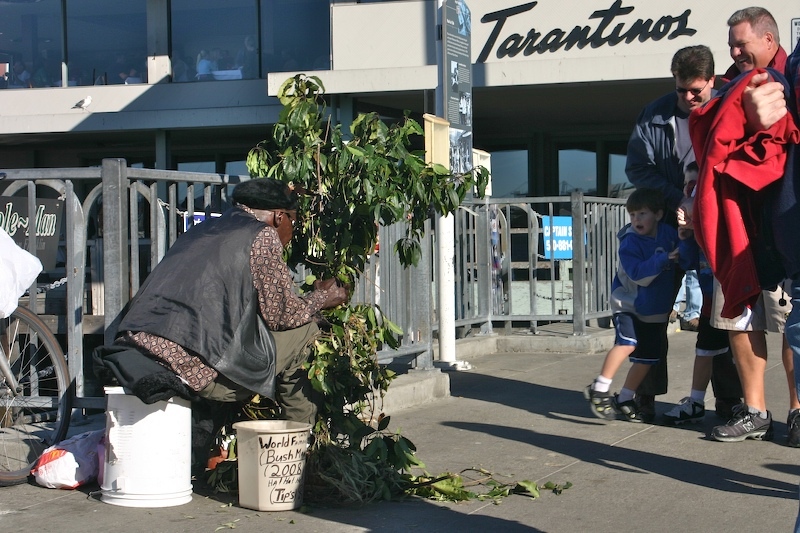 In San Francisco, there are a lot of street performers, especially at Fisherman's Wharf. 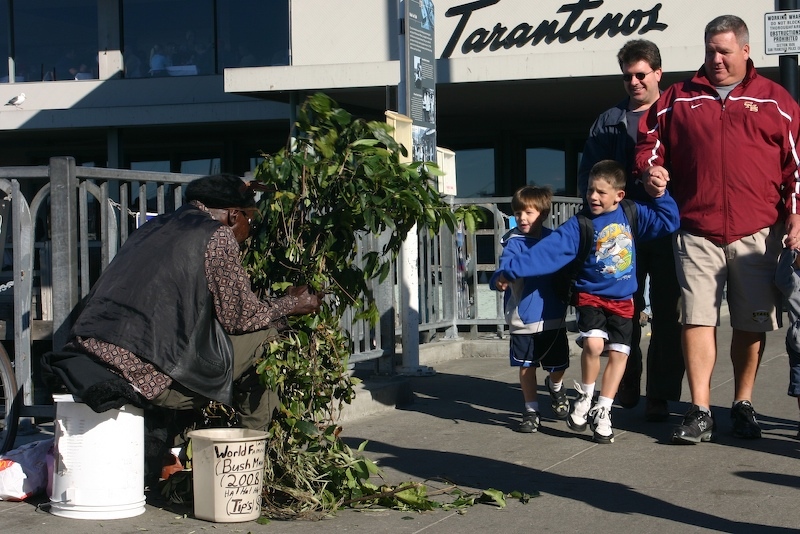 I remember the Bushman ever since we first moved to the Bay Area and a quick lookup in wikipedia says he's been a street performer since the 80's. Hoping that my nephews would react predictably, I ran ahead to scope out a spot to take some rapid action shots. 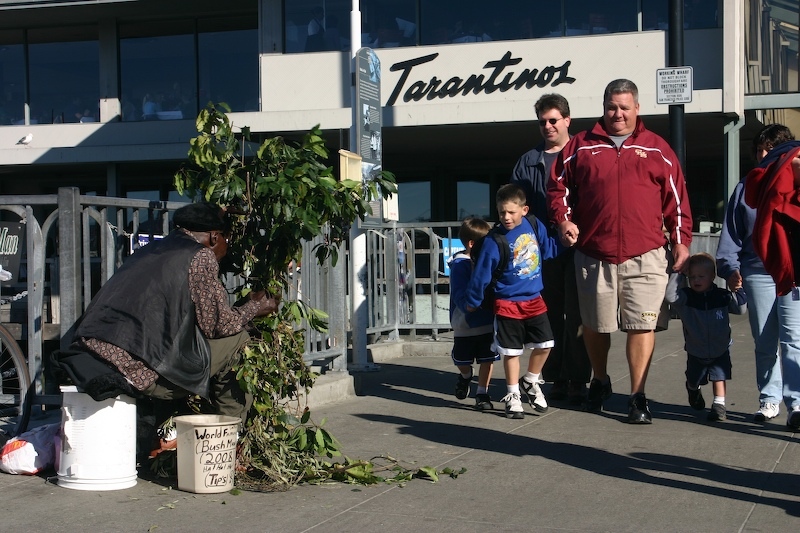 The Bushman is in the forground and they are walking along the sidewalk on the far right, making their approach. My brother-in-law is in the red jacket. As they get a little closer, Ry notices the shrub, but doesn't really think anything of it. You can already see in Jimmy's face (sunglasses, behind the boys) that he knows what's gonna happen. They both jump back into the safety of Daddy and Uncle Jimmy. 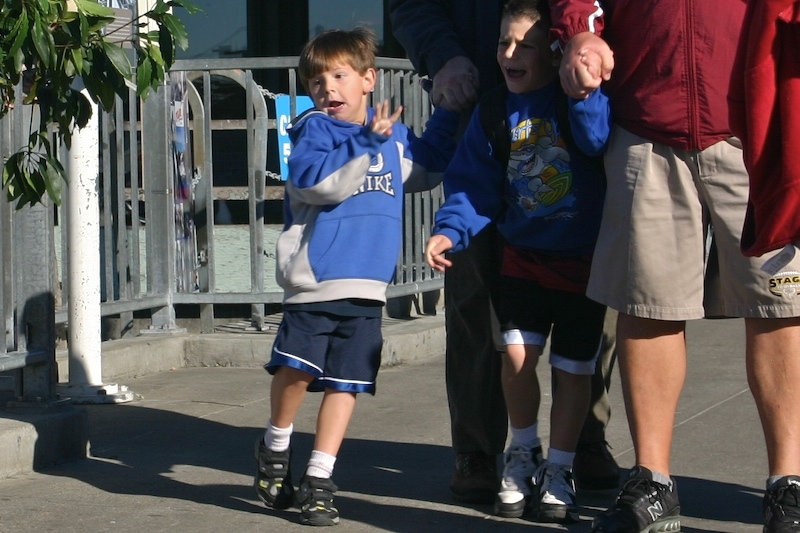 Older brother Ry has completely hidden behind Dad and little J ready to run the other direction. Of course, dad and Uncle Jimmy find it quite hilarious. (So does Aunt Madeline, trying not to laugh too hard so her photos won't be blurry). In the end, the boys had a good laugh and left with smiles and giggles. 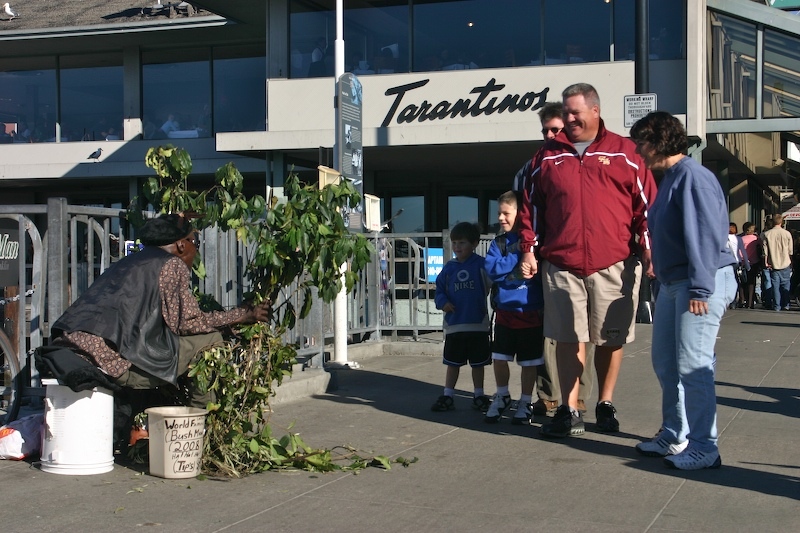 Here's a link from Youtube that someone else captured of the Bushman on another day. Wonderful record of the scare! We saw him in San Fran also. . . nearly sent my parents into fainting. Mad, those are fantastic shots, i love the one of the kids with the expression on there faces. 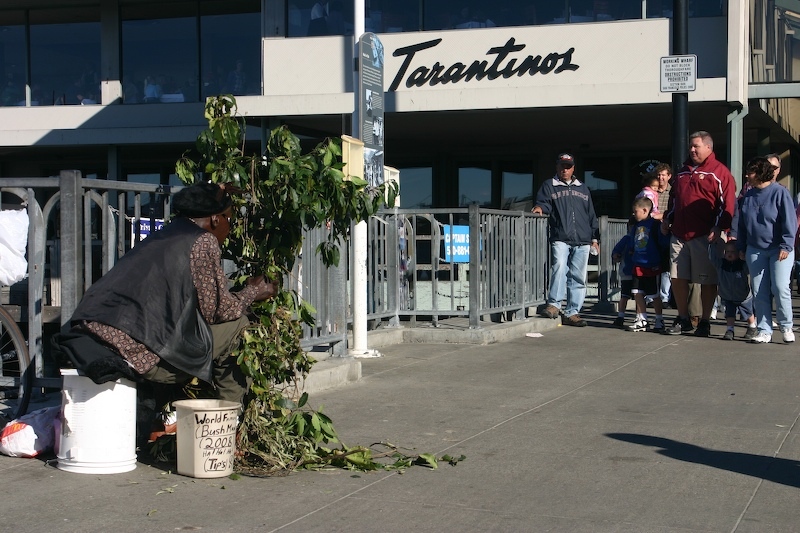 Many Many yr ago we had been to San Fransisco and i remember many of the streets had some activity going on. It was my first time there, a bit overwhelming at the time, as we came from a small town, wasn't used to seeing buildings with bars on them. We also enjoyed Alcatraz, Are they still allowing visitors there? That's hysterical, Mad! I can't believe I've never heard of this guy! Good for him. I hope it earns him enough to make him happy with his life! Wow. That is crazy. And very funny -great photo work. I'd probably have similar reaction. 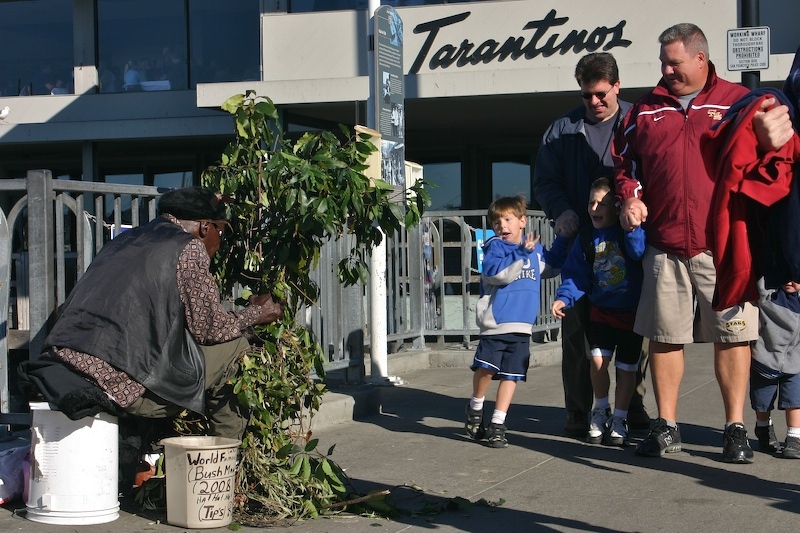 I had a friend who lived out in the Bay area... wonder if she ever saw the Bushman. Oh, that's funny. Great capture and close-up!